“WHAT ARE YOU?” Its voice thundered in my mind as I struggled to breathe, struggled to see. Acrid smoke filled what was left of the bridge, while my ears still rung from the decompressions and violent blasts. Slowly sight and sense returned. Sharp pain flared at the slightest movement as I found my bearings, suspended a half meter from the deck and clamped tightly in the grip of a chitinous arm. Held firm and unmoving, it was surely crushing ribs as it lifted me for inspection. I followed the arm to the black mass of the body, feeling the pulsing heat as it seemed to glow from within. Brief understanding gave way to further horror with the realization it was not some exo-suit, but a massive insect-like creature. Its head drew close, the hot wretched breath grew in what was surely my last vision. Yet is paused. Obsidian, alien eyes stared at me for a moment and then it dropped me against the bulkhead. Drawing a painful, rasping breath at last, I watched it and several similar forms withdraw to the opposite side of the cruiser’s command deck. A large opening was rent in the hull. The interior seemed to glow with the same heat as the creature, the edges seemingly fused to my ship’s skin. They slipped through the opening and disappeared from view. The one that left me dying stopped to gaze back once more. A glacial ice shower of sensation wracked my broken body. In a glance, it probed my very fiber and bared my soul to it. I was defenseless. Her name was Sitka. The dread left as she retreated to her ship. Sparks and fires continued to flare, casting shadows of the smoke through the dim emergency lighting. The others were dead. Killed by blast or burns or rent to pieces by an unknown force. Dispassionate and shock-ridden, I remained, unmoving. With unnatural clarity, I realized my spine must be broken as I felt none of the pain I should from my shattered legs splayed beneath me. The inside of the hull opening glowed brighter and then closed tightly like a nightflower’s petals. The outer ring began to glow orange then white. Its warmth washed over me a moment until I realized it was detaching itself from my hull. Cold, dead space would replace the alien ship. Panicked, I struggled to find a zero-g helmet to seal my gel suit. One was racked nearby and I reached with the bloody stump that was what remained of my right arm. Beyond shock, I managed to half-turn, half-fall to clasp it in my left. Panting for breath on my side, I was able to seat it in the collar and engage the lock. A pulse of air cleansed the contained atmosphere and I drew my first clear breath. Warnings flared on the HUD, but I could only lay with disinterest as the white-hot glow of the alien ship’s outer ring grew blinding. The heat singed and burned as the ship disengaged from my crippled craft. The light dimmed to a fiery red as my helmet’s photosensors recalibrated. In a blink, the ship cleared the hull and sped away. With a violently increasing speed, I was carried to the hole left in the hull along with all the other loose wreckage of steel and flesh that littered the bridge. Swept through the hole in the debris cloud, I spun away from the hulk of my ship into the cold grips of space. “…Richards!... I said, ‘Get up!’ …now!” Another unceremonious kick rattled the bed frame as Richards groaned with a low rumble as he awoke and brought his systems online. The process was becoming routine, but he still needed to follow the sequenced checklist with the number of augmentations he was adapting to. His ocular implants fired up and cycled through their modes as he raised his right arm, a crude prosthetic from the elbow down, to stave off another bed-rattling kick. “I’m up, Natalie, I’m up.” The learned neural pulses twisted his hips to help him rise to a sitting position, while his lower half dropped to the deck with a slight mechanical whirr and a loud metallic clunk. He itched the scars beneath his ragged beard. A final stretch and crack of the flesh and bone portions brought a slight smile as he disconnected the charging relay and brought all of his systems up to normal power. He stood and with only one shuffling stumble, made it to the metal sink and mirror mounted on one wall. “You’re almost looking like a natural on those…at least natural for a clumsy oaf.” A muffled snort was the only reply she got from him as she slipped out of her coat and sat on her rack to loosen her boots. Richards watched her in the mirror as he splashed water on his face. Odd for a Mav, especially a Cog, Natalie was almost pure bio at first glance. Although he knew at least one of her arms was a high-grade prosthetic, loaded with sensors and tools, but indistinguishable from a natural one. She had a couple of data port connections near her left ear, but they were usually hidden by a loose strand of hair. Richards suspected though, or gathered from snatches of conversation, that most of her implants were internal. Cognitive enhancers, data libraries and analyzers, likely made up only a portion of her tech package, but he felt she could probably have gotten by without them. Natalie was a natural with a gift for patching things back together. Luckily there was no shortage of work around here. He tuned to the table and with resignation picked up his tube of biomass. The bland goo was engineered for him to help him heal and adapt, but the sensation of actually chewing and tasting something was decidedly lacking with its jelly-like texture and oily tang. A combination of proteins, antibiotics and crude nano-meds, it was provided by the ‘Doc based on his near daily blood samples. At least it was going down easier, but his sour expression still drew a smirk from Natalie. Denying her the satisfaction of seeing any more of his distaste for the stuff, he keyed on his hand comp and looked at his work sched for the day. “C’mon! The compensators on level Rho-6? It’ll take me half the shift just to get down there. This is the third in a row of these that I’ve got,” Richards exclaimed wiping a glob of goo from his beard. Richards reflected on his morning as he found himself towing a grav sled with the parts he needed through the bowels of Themis Station. Instability of the structure in the area he was headed had caused some tunnel ‘close-ups’, as they liked to call them. What it meant was the long route had to be taken to get down to the mechanical section on underlevel Rho-6. This close to the skin of the station meant the gravity was light, too. The bulk of the most habitable areas of the station could maintain a respectable 0.75g. He’d probably be working in something closer to 0.4g which was a pain in his new metal derriere when he had to torque and shove the big parts he was dealing with. The mag-grabbers in his prosthetic leg package should do the trick, but they were drawing way too much power due to some glitch ‘Doc hadn’t tracked down yet. Not that she was too interested in finding it. He stopped to wipe a bead of sweat that dripped on his ocular lens and moved on. I had to grit my teeth for the benefit of the newly minted Commander Daniels in charge of our cruiser. She might be worth something in ten years or so, but they pushed up too many kids, too fast to fill the ranks after Phobos. She had the iCom mouth on her, though. Must still be part of NavOps 101. “Ma’am. The reason I can’t give you a positive ID is because there is nothing in our database that matches that energy signature. I’m trying to filter to see if it’s spoofing us, but it’s taking time to find the layers to peel away. Nothing should be giving off that much power. Must be some Mav’ scrambler or something. All I can do is work through it.” With what’s left of our sensors and systems, in any case. “New bandit bearing oh-five-niner, oh-four-four high, range dead on one point three million clicks,” the tac officer called out. “New multiples disengaging. Fifteen, twenty… no at least thirty new signatures,” the tac officer chimed in. I saw the incoming data returns scroll with disbelief as the tac officer repeated what I was watching myself. One of the bogies had turned towards us accelerating at near eighty gravities! It was on a direct intercept course. The Hellcats ran a pretty tight ship, as far as Maverick security went. Themis was big, though, and they were small for one of the major gangs, even with all of their support personnel. Mostly it was freelancers doing the dirty work. The Hellcats kept to themselves doing what they did best – small-craft operations and quick raids - either for themselves or to any who could afford their price. For the rest, and especially for the mundane tasks like keeping this asteroid flying, they farmed out the work to a variety of groups and individuals. That left many forgotten and under used parts of the station infested by whatever scum chose to latch onto it. Richards was headed through such an area. He’d seen some Regulators brought in to beef up the private security, but they were almost as bad as any of them. Luckily techs were usually left alone. Enough breaks out here that you would likely be the next in need of their services, so rolling one was only worth it if the score was big. Again, unfortunately, the parts Richards was hauling fell into that category. There was enough traffic on the way down to keep things on the level. Wide service corridors connected an array of old mine processing areas and docking bays. The equipment had been long stripped away and replaced by a hodge-podge of hab containers and illicit transfer hubs. Small shops, bars and hovels pockmarked the walls in the warren of twisting corridors. It was in the interest of most to mind their own business, but there were always those who tried to increase their influence or little bases of power. It did matter how many times or how brutally the Hellcats had to prove they exercised ultimate control over the going-ons on the underlevels – some wise guy always pushed them to demonstrate once again. The act of proving who was in charge usually fell to freelancers – hired guns. Though quite a handful of the Hellcats would be up for the job, even enjoy doing it, Gemma had determined early on they were too valuable and didn’t want them down knocking heads in the bowels of Themis. That job fell to a hodgepodge of security forces, more and more under the purview of the Regulators. It mattered little to Richards, though. His uniform and bio-ID made it clear who he worked for and that made him mostly hands-off. He took a few knocks from time to time on solo assignments, far from prying eyes, but his memories of those were hazy and seemed to be the exception rather than the rule. Most people avoided him down here, in any case. 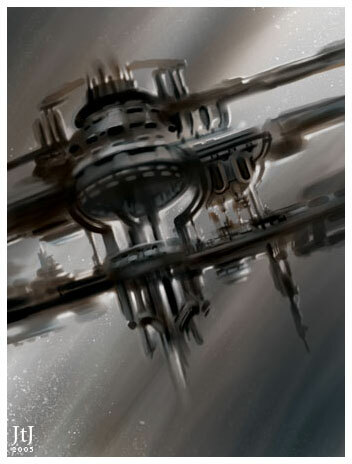 He crossed through the din of the lower deck city-node and reached a controlled access port. Punching his code into the archaic key pad, the blast door slowly opened giving him access to the airlock. With his gear inside, it closed and he pressurized to balance with the exit. The display cycled from amber to green and the second door noisily slid aside. His skin tingled as six dark figures stepped through the opening armed with an array of blunt objects and pointed purpose. Twenty-two hours out of Ganymede and I’m already part way through my third watch. Feels like seventy-two hours. They said these new Hellion’s were good little birds, but way too automated for me. It barely takes twenty minutes to do rounds the old-fashioned way, but the new kids seem happy to do most remotely right from their stations. I swear there are hatches that haven’t been cracked since the yard-boys signed off on this cruiser. “Ma’am? Strange readings popping up in our starboard quarter. Trying to lock them down,” Reynolds the SensOp guru said, his deep voice breaking the quiet calm of the bridge. I glanced at my repeater screens and thought he might be on to something. Some pretty intense gravitics fluctuating there. Too far from Jupiter and well clear of the asteroid belt. I grudgingly nodded and pulled myself to my station I had fallen from. The bridge was a hive of activity with all the off-watch personnel crowded around terminals and the air filled with the din of confused chatter. Trotski, who switches watches with me, was back at my console staring at the readouts without even acknowledging I’d been lying on the deck for twenty minutes. I could only stand rooted to the spot. We were so close, it filled the whole expanse of the forward view. A sense of burning ice welled in the pit of my stomach. It was coming. My skin tingled… Trotski, running the sensors, called out about a gravity pulse. Bridge lighting dimmed as we were caught in the fore wave. The cruiser’s internal compensators momentarily failed, sending everyone and everything not strapped or bolted down flying about the bridge. Everything except for me. It came. Seyal rent its path through the Rift trailing a miasma of sub-atomic particles in its wake. Each one, for a moment, strikingly clear to my eyes. Whether it was minutes or hours, I could only watch as the new planet, ringed with lightning through its clouds fought to settle amidst the pull of Sol’s gravity. Our cruiser hung lifeless, much of the crew already dead from the violent accelerations as the planet pulled us in its wake. Slowly my head cleared as power was restored and the ship’s systems rebooted. My senses returned and I took stock of the bridge, horrified at the carnage I had overlooked. Some hours later a semblance of order had returned. Fifty-four of the crew complement of a hundred and sixty had died, Connors and Trotski amongst them. We had removed them to a storage area while a skeleton crew of those more or less uninjured tried to ascertain what we had witnessed. The new orbital body, now over half an AU away and slowly being pulled into an orbit was quiet, but the giant rift in space remained. It didn’t call to me like it had before, but its image was burned into my mind’s eye. We were all numb as energy signatures came alive on the planet. Detaching and heading for us. “How is he?” Gemma asked as she looked through the view port on the radiation-shielded isolation room. “Lieutenant Richards, report to Astro Control.” I looked up by instinct at the com panel, forgetting the visual display was still on the glitch. Replacement parts took forever to find their way out here to Ganymede, especially for a lowly junior officer’s quarters. Why did I get talked into taking this commission? The life of a petty officer was much cushier. Enlisted working under you. Leading the junior officers (like me, now) by the nose until they could find their arses without a map. Respect from the command staff when they needed to know what was really going on. Command staff was the key. I wouldn’t rise high – never get a senior position without connections – but I’d rise fast. Begin making decisions instead of having to live by those others make. As I muse, I work my way through the warren of corridors to reach Astro and am flagged over by Lt. Commander Michaels, my old CO. He put in enough good words for me to get my commission in the first place, but never stopped ribbing me about abandoning him and how ‘horrible’ my replacement, Carter, was. Carter was one of the best damned techs in the unit and she would make senior chief years sooner than it took me to become a petty officer … kids these days.